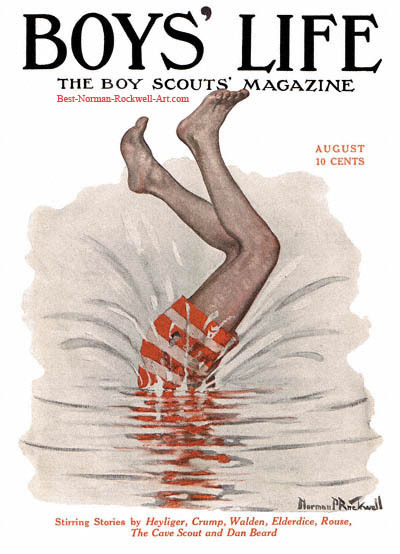 Tail End of a Dive, this Norman Rockwell painting, appeared on the cover of Boys' Life published August 1915. An alternate title for this painting is Half a Boy. 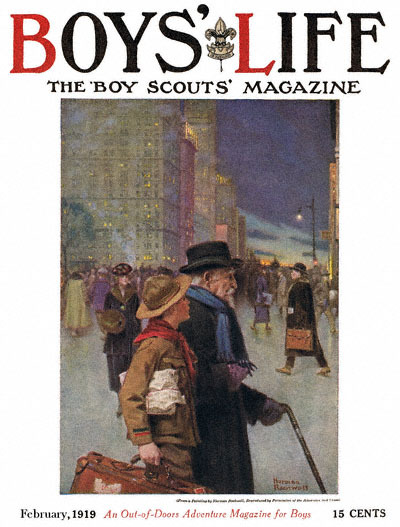 This event marked Rockwell's eleventh cover publication for Boys' Life. And Rockwell was well on his way to achieving icon status as well. This painting is signed Norman P. Rockwell in the lower right hand corner. Rockwell painted this illustration before he stopped signing his middle initial. His middle name was Percival and he was not fond of it. Tail End of a Dive is one of the first covers Rockwell painted that actually looks like a Rockwell. That is, it looks like some of the covers that we usually identify with Rockwell. The previous covers in this series for Boys' Life were all fine paintings. However, they did not show the perspective and polish that we have all come to expect from Rockwell. This cover hints at the greatness that was to issue forth from the brush and canvas of America'a favorite illustrator. The detail, the subtle use of light and the almost three dimensional quality of the illustration - all are suggestive of the best of his later and more popular works.